You can download our whole booklet “Coming Home – Going Home”, as a pdf. format. Coming Home Going Home. pdf . Booklet - Coming Home - click on the link below. When a loved one receives a prison sentence it can have a devastating affect on the family. This is particularly true for families who experience this for the first time. Individuals work through this experience in different ways: visiting the prisoner and trying to maintain relationships from a distance and over the counter of the visiting room. In most cases they feel they must support the person in prison, through these visits and supplying financial support for extras. And making sure that the children of the prisoners keep contact with their parent in prison. Children in particular suffer greatly when a parent goes to prison. They may feel unable to talk about it with their friends because of the stigma attached. They may feel unable to talk to other members of their family about it because they do not want to upset anyone. In effect, prisoners’ families are also serving a sentence. Most of the research on imprisoned fathers indicates that families are rehabilitative assets in the prevention of re-offending. Fathers who assume parenting roles after returning home from prison are less likely to return to prison. However, positive outcomes depend on managing relationships while in prison, something which is fraught with difficulties because of financial struggles, distance and visiting arrangements in many prisons. The role and policies of most closed prisons regimes are naturally dominated by security issues. However, these issues do not often facilitate positive parent-child relationships, or adult relationships. Many people who are imprisoned use their sentence to work on issues that may help them live better lives on release and they are supported by many prison based agencies to do this. 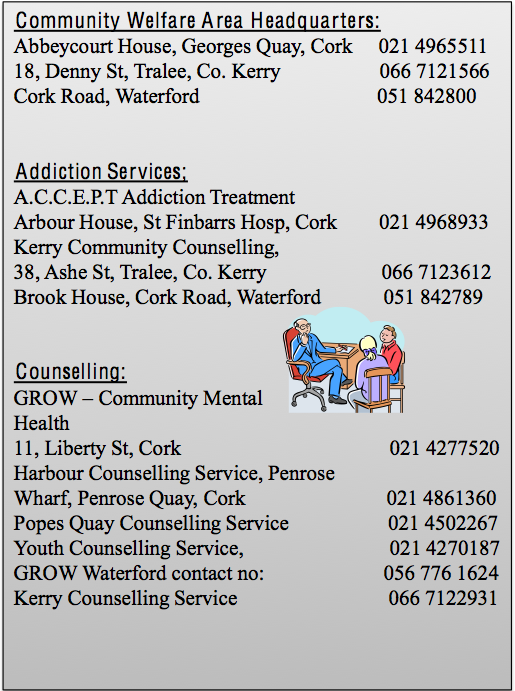 They attend addiction or psychological counselling, take part in education programmes or training workshops. All of this prepares them well for re-integration into their own family and community. However, family members outside often resent the apparently “easy” life being lived by the prisoner, where three meals a day are provided, there are no bills to pay, no difficulties with the children, no homework to be done, schools to be organised…….. While there is a great sense of relief when the prisoner is released, there is often an underlying fear of what the future may hold for their relationships and the family unit in general. How will they manage the changes that both partners have experienced in the time they spent apart? How will the growing children react when the once absent parent starts to resume a role in parenting again? In the following pages, people who have experienced the joys and difficulties of the homecoming share their experiences. Their accounts are honest, painful, happy and thought-provoking. We hope this booklet raises awareness of the issues that come to light when a loved one returns home, whether it’s after one week, one year or ten years. My son was sent to prison for an offence related to him gambling. I was distraught and devastated. But I visited him and supported him as much as I could. While he was in prison he sought help with his addiction and appealed his sentence and he got an early release. One morning I answered the door and there he was on the doorstep. I hugged and kissed him and welcomed him home. I was so relieved that he was out of prison and believed he would now seek support for his problem and settle down. I went with him to buy new clothes and shoes because he had left everything in the prison. Because of other family considerations he could not live at home and he had accommodation in a hostel. I found it hard to accept that my son would be living there but I had no choice but to accept the situation. While my son was in prison I had started to attend St Nicholas Trust Support group and this helped me to see that I was helping him too much, which was preventing him from taking responsibility for his own actions. This was difficult for me to accept at first, because he is my only son and I wanted him to have a good life. My other children will not help him because he has caused them many problems in the past. Our family unit has been ruined by my son’s behaviour. I have nobody to discuss it with in the family because they are tired of it all. Because of the support I got from St Nicholas Trust and from listening to other peoples’ experiences in the group, I have become stronger and better able to refuse my son when he asks me for money. I realise I have over-indulged him in the past. It has been very hard for me to let him go. He is now living in an apartment and appears to accept that he will have to manage his own finances. He is trying to find work but in these difficult times it is hard for anybody to find work and being and ex-prisoner adds to the difficulty. I am not his keeper. I will meet with him when he contacts me and support him in any way I can but I have learned to let go and trust he will learn from his mistakes. I knew that my husband was coming home about two and a half months before it actually happened. So we, as a family, had time to prepare for his homecoming. When the day approached, and because his case was high profile my constant worry was that the media would invade our privacy again. Having lived with a thin veil of privacy during his incarceration, my stress levels were very high. During his absence, the loneliness and emptiness was like a “living death”. Keeping my family together during this time was a struggle and an experience of personal growth, strength and faith. Our love for each other never waned because I knew and loved the person and not what he was convicted of. Forgiveness is a grace that is “God given”, because if you cannot forgive you cannot move forward and rebuild your life. Now that he is home it’s just so wonderful to see him in the kitchen, in the garden and in every aspect of our daily life. Every moment is precious, every hug is a treasure and every smile is a glimmer of hope for all the families who will have to go through this awful ordeal of having a loved one imprisoned. Many children are not told when a parent is sent to prison. There are many reasons for this: fears that they may be traumatised or that it gives them permission to get into trouble, like their parent in jail. It is a parent’s right to make that decision, but most of the available research shows that it is better, in the long term, to tell them, giving consideration to their age and maturity. Children are often told that the parent is “working away”. However, children can often sense that something is wrong in the family and may reach conclusions which are not true . For example, the child often thinks that the parent has left the family for good, has abandoned them or doesn’t love them. Professionals who work with children of an imprisoned parent point out that the loss of closeness and contact can be compared to other family crises such as illness or death. For the children of prisoners, the difference is that they are alone in their loss if the imprisonment is kept as a family secret. The child has nobody to talk to and they may act out. Sometimes these difficulties can cause health issues for the child. They may become aggressive and introverted, or show a lack of concentration at school. Managing this behaviour can be very difficult for the parent at home and also for the parent in prison, who cannot manage parenting from a distance. The homecoming can raise tensions for all the family, including the children. They must all learn to rebuild their relationships. One father discussed the difficulties he experienced after the first few days of his release: “I’m not used to being around noisy children. I have been used to my own space and now I prefer to be alone. That doesn’t mean I don’t love my children but part of me feels uncomfortable around them”. Research into the successful reintegration and the role of family and friends in this process was done by the Quaker Council for European Affairs in May 2011. They highlight the importance of family support while the prisoner is getting back on his/her feet. Some of their findings are outlined below. Prisoners’ family relationships are among the most important factors in their rehabilitation. A stable home environment can be a base of strength while a prisoner faces the challenges of finding a new job and adapting to a new lifestyle ‘on the outside’. This is especially true when the prisoner in question has served a long sentence. Family contact is important because it can help to stabilise the prisoner on release. Families do this by offering practical support and reinforcement, but perhaps more importantly because they reinforce the prisoner’s motivation to stay out of prison and help them to achieve their goals. Prisons must therefore facilitate contact between prisoners and their families, so that the socially isolating effects of prison are reduced. Unnecessary practical restrictions on family contact should be removed. Most European countries surveyed do not monitor or track the average distance of prisoners from their families, though some countries have the explicit aim of keeping prisoners close to their homes where possible. This is important because it allows for visits and these visits keep the family relationships alive. Most countries allow prisoners to receive visitors once a week or more. Good practice in resettlement planning suggests that quality family contact can have a great impact even on serial reoffending. allow prisoners home on conditional release before the end of their sentence so as to acclimatise them to life outside prison gradually. reduce the isolation of foreign prisoners whose families are unable to visit them in person by making available additional opportunities for contact by other means (for example by allowing them to make more phone calls).